as well as fielding calls on the technicalities of his photometer, Munsell continued being an artist, remaining true to his artist roots. It wasn’t uncommon as an artist at the turn of the century to earn a living painting portraits. (It’s still a source of income for today’s artists.) So during this busy time in Munsell’s life, he also began working on a portrait of Alexander E. Orr*, who was not only a highly respected New York businessman, but also A. H. Munsell’s father-in-law. According to Munsell’s diary, he started the portrait on February 22, 1905, which he was commissioned to do for the trustees of the South Brooklyn Savings Bank, of which Alexander Orr had been president. Munsell completed the portrait after 13 sittings in April of 1905 (just seven years after Brooklyn became annexed to New York City). As if Munsell didn’t have enough on his plate, he was also called to be an expert witness, thanks to his work in developing the photometer. Munsell was paid $25.00 for his time and to develop tests to determine if an obstruction of light contributed to damage of the Albany building caused by passing L trains. A multi-tasking Munsell continued to develop and market his color education materials all while practicing his craft and applying his color expertise where needed. Learn more about Munsell color education tools. *If the name Alexander Ector Orr sounds familiar, it should. 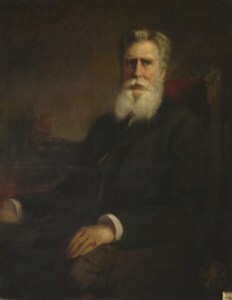 A. H. Munsell’s son, who later took over the Munsell Color Company following A.H. Munsell’s death in June of 1918, was named Alexander Ector Orr Munsell or A.E.O. Munsell. A. H. Munsell Color Diary, 1908-1918, Volume A Part 9. Courtesy of Rochester Institute of Technology, Munsell Color Science Laboratory.